Are you looking for lawyers for dog bites? The attorneys at Krupp Law Offices can help you. We have over 85 years of combine legal experience. When you are injured by a dog bite, having the right lawyer on your side is not an option, it’s a requirement! We can do an initial evaluation of your claim over the phone with ten minutes of your time. We will evaluate you claim and discuss the dog bite claims process with you at no cost. If you want to move forward with your claim, we will meet with you to get started. You have nothing to lose by picking up the phone. How Do I Know if I have a Good Dog Bite Claim? 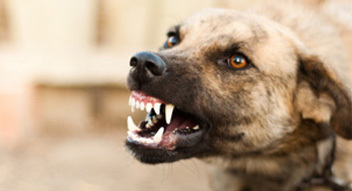 The dog bite lawyers at Krupp Law Offices will review the facts of your claim. we will review your facts with Michigan dog bite law and explain how it applies in your case. Dog bite claims in Michigan are strict liability. This means that you do not have to prove the dog owned did anything wrong. You merely have to prove that they own the dog and you were injured. The only defense to a dog bite claim is provocation. You did something such as hitting the dog, that resulted in the dog biting you. What Damages can I Recover with a Dog Bite Claim? Dog Bite claims are similar to other personal injury claims. You are entitled to compensation for medical bills, pain and suffering, lost wages, reconstructive plastic surgery and other future damages as a result of being the victim of a dog bite. What if the Dog is owned by a Relative or a Friend? I don’t want to sue them? If you are bitten by a dog that is owned by a relative or a friend you can still recover money for your injuries. Dog Bite claims are similar to other personal injury claims. You are entitled to compensation for medical bills, pain and suffering, lost wages, reconstructive plastic surgery and other future damages as a result of being the victim of a dog bite. Typically, your relative or friend will have insurance. The insurance that they bought to pay people who are injured will pay the claim, not your relative or friend. They will pay nothing. If your claim exceeds the insurance policy, you can waive the balance of your claim against them personally and only take what insurance will cover. Who Pays My Dog Bite Claim? Typically dog owners have insurance. We contact the dog owner and request their insurance information. We then contact the insurance company and provide them with information about liability and damages. Typically, the insurance company evaluates the liability and damages and makes an offer to resolve the claim. If an agreement cannot be reached with the insurance company, a case is litigated through the court system. How Much Does a Dog Bite Lawyer Cost? An initial consultation with a dog bite lawyer is FREE. It costs nothing to start your case. If you want us to purse your dog bite claim with one of our lawyers, we will have you sign a contingency fee agreement which states that we get one-third of the recovery of your case. For example, if you case settles for 32,000 dollars and you have 2,000 in costs, the recovery would be 30,000 dollars. We would receive one-third of that amount or 10,000 for our work. If you get nothing, we get nothing and you owe us nothing! You have nothing to risk. How Do I Get Started with My Dog Bite Case?